Forest-bathing involves a trip to a forest to relax and relieve stress. First recognized in Japan in 1982, forest-bathing is now considered a viable stress-reducing technique and is becoming popular in the United States. Forest-bathing is also known as Shinrin-yoku. Researchers have confirmed the positive influence this technique can have on well-being and quality of life. There are also improvements of physical and psychological health. Forest-bathing is in essence being with nature and allowing the senses to become affected by the smells, sounds, and feelings associated with a forest. This process can have a calming effect on the individual and even decrease blood pressure. In the treatment of substance abuse addiction, forest-bathing should be considered a natural alternative. One aspect of substance abuse treatment has to do with serenity and spirituality. Finding and developing a sense of the soul and finding peace in recovery are important. Nature is a place where simply just being with nature can refocus the mind to a more positive, calming place. 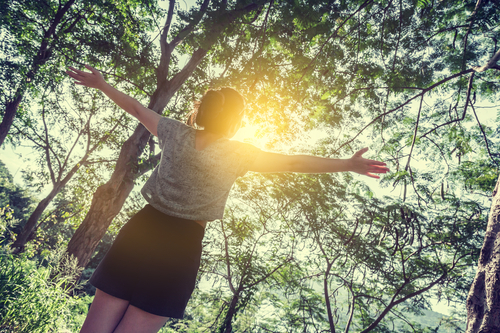 A person in recovery could benefit from forest-bathing as a way to relieve stress and to experience what it is like to be in a relaxed state. Research indicates that a calm mind is less likely to feel anxiety or depression, both of which have been noted with individuals who relapse. In addition, being in nature allows one to think about their addiction and the road to recovery. Not everyone has a forest nearby or a place where they can be absorbed in nature. Some may find solace in simply being near an ocean or a lake or a park near their home. The objective is to be in a place without distraction and without cell phones or other interruptions. In order for nature to work its magic, the individual should find a quiet place, relax the mind by taking a few cleansing breaths, and perhaps closing their eyes and meditating. The sounds of nature can be soothing and calming and allow one to process emotions in a healthy way. Another alternative to actually being outside in nature is to buy tapes on the sounds of nature and listening to the tapes throughout the day. Others may find help in the sound of an ocean or a fountain, which can also be purchased for home use. Our family of dynamic recovery professionals works to serve you and your family through every step of the journey to recovery. Help is one phone call away. From intervention to Safe Passage Transportation, all of the service and coordination by Hired Power is designed to help you and your family focus on bringing recovery home. Call 714-559-3919 today for more information.